Tosca, Welsh National Opera, Cardiff. Review by Barbara Lewis. Cast includes: Claire Rutter, Hector Sandoval, Mark S Doss, Daniel Grice, Donald Maxwell, Michael Clifton-Thompson, George Newton-Fitzgerald, Jack O’Kelly, Rosie Hay. Running time: Two hours, 40 minutes, including two intervals. Human relationships boil down to trust and betrayal; power and powerlessness. It’s the story of Hollywood and Harvey Weinstein and it’s the gruelling plot of Tosca. This version, first performed in 1992, is firmly set in the times of Napoleon’s invasion of Italy and its style is classic to the point of fatalistic. Rather than drawing out the timelessness or the depressing topicality, the focus is on delivering the innate drama, undiluted by sub-plot or light relief, as we race through from Tosca’s innocent, loving jealousy to Scarpia’s calculating manipulation and compulsive betrayals, bolstered by the fabulously bold sound of the orchestra, conducted by Carlo Rizzi. Ashley Martin-Davis’ design gives us three clearly-defined settings that make the most of the stage’s height to dwarf the lovers and emphasise Scarpia’s stature. For the first act, we feel the chill of a huge church where the protagonists huddle at the feet of a giant Crucifix and in front of a grill through which the escaped prisoner Angelotti, a fine-voiced Daniel Grice, continues his flight. It’s also the backdrop for Rutter as Tosca to play out the jealousy core to her loving nature and child-like, vulnerable need to hear constantly from Mario (Sandoval) that no other woman’s eyes are finer. The tension swiftly builds and the tragic ironies start to pile up. The sinister climax is a papal procession, reminiscent of the Ku Klux Klan, again magnified by the rich, orchestral sound that only Mark S Doss, as the towering Scarpia, can match. 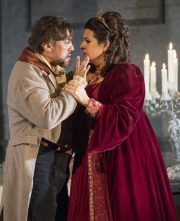 Rutter and Sandoval as Tosca and Mario, by comparison, lack power, which is fitting on the level of plot but undermines their charisma as lovers. For the next act, Scarpia’s supremacy is at its height as he dines in his splendid cold rooms and manipulates the lovers. He is a truly modern villain, with the self-knowledge that his appetites are depraved and cynical and an emotionally-detached determination to exercise his power to satisfy them. His performance draws out the humanity and passion of Rutter’s Tosca, whose performance of the exquisite “Vissi d’Arte” trembles with emotion. She turns to steel to deliver “Tosca’s kiss” and stab Scarpia before piously laying a crucifix on his corpse in a gesture in keeping with past productions, but possibly overstated for modern taste. For the final act, we’re on mighty battlements that plant us firmly in Napoleonic times for the emotional crescendo of Tosca and Mario, imagining, with crashing dramatic irony, a life of love and freedom before them. As the lovers, Rutter and Sandoval are at their most moving but they never attain the effortless power of Scarpia. London Grip Poetry Review – Dixon	La Forza del Destino,WNO, Cardiff. Review by Barbara Lewis.